So it’s Thursday night, my friend Pat tells me about his NYC halloween party at his new appartment. For the last 10 years, the most frustrating part of halloween for me has been the manilla costumes that go with it. Vampire/Zombie/Elvis/Gladiator/anything from costume store only open for 3 weeks a year. I just can’t show up in an ordinary halloween outfit this year. 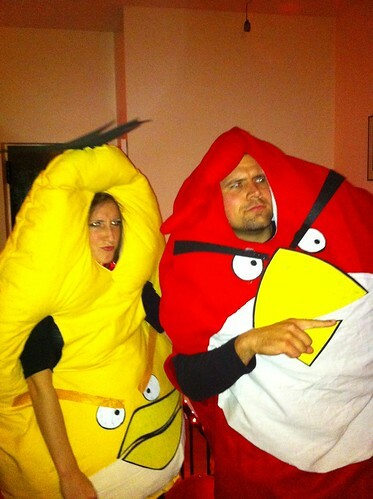 After googling around for some ideas, I bump into Angry Birds halloween blog which immediately appeals to my geekier side. I emailed the editor and they even sent instructions to help share how they did it. After sifting many sites find the only way to make this costume is by having it custom done. I have no sewing skills nor do I intend to pick up a new trade. I can barely take my clothing to the dry-cleaners consistently and I got Viddler to focus on. Quick, I need help with a costume party for tomorrow. 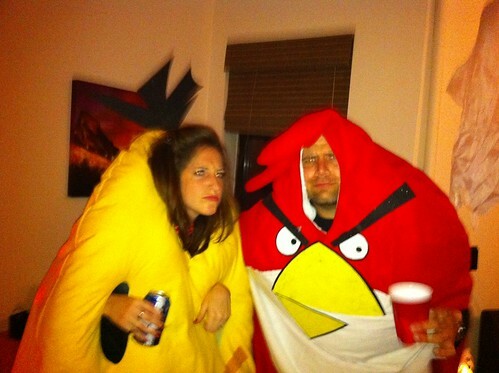 Looking for the angriest of angry birds costume. If you didn’t know Angry birds is a very popular iPhone/Android app. I also put one up in Allentown that got no responses. Within an hour I get three responses. 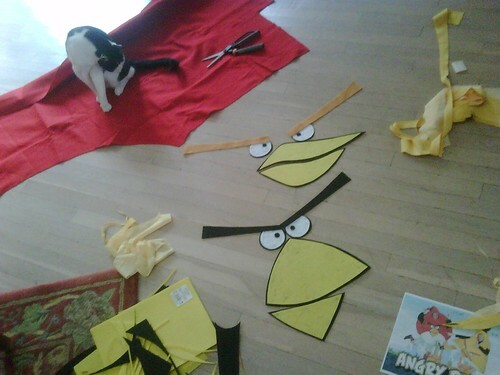 My favorite is from Gabriela titled “Maker for your Angry Bird Costume”. She’s already laughing from the post and is a Prop/Artist Stylist and is around same age as me. We go back and forth on email on price and design and come to $150 for two costumes. It seems market rate is around $100/costume and I explained to her my situation and was very considerate. Pay her $75 at that point via Paypal with expectation for rest to come upon delivery. In a little bit of a panic Gabriela informs me that I should bring a backup costume just in case. Due to us going back and forth late Friday night all the fabric shops closed down. I get a little worried but g/f has a backup devil costume and I can only assume I can find a costume last minute in NYC if need be. Bus leaves Allentown to NYC. Gabriela starts sharing photos of the costume half-done, which only makes me worry more, cause I know I couldn’t put something like these together in a few hours and baseball game starts at 6pm and party starts at 9pm. This looks like it’s still days from completion. Plus the red one isn’t done! Okay, so not going to be dressed for the World Series part of the event but I should be okay as the real party doesn’t start till 9. Party has started and Gabriella has informed me she is in route. Should be there in 20 minutes. Luckily most people are fashionabily late but not the biggest deal. Gabriella arrives. We still hadn’t talked on the phone at this point. She is at the door in taxi holding two bags with costumes. We both hug and rejoice in the effort. I give her many thanks and she seems relieved that this is craziness is complete. Don’t even look at the costumes and give her additional $80 that I owed and we both walk away almost saying in sync “what would we do without craigslist!“. The night’s a blast. Angry birds is a huge hit at the party especially for iPhone owners. Not sure what will happen of the costumes. They were very well made. 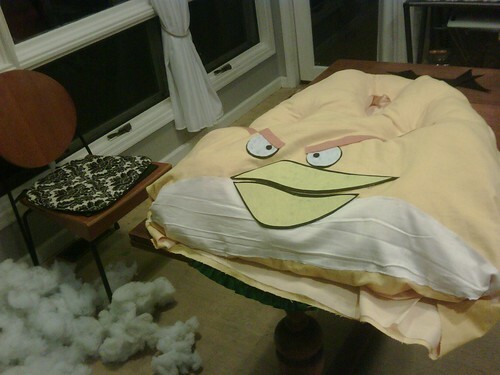 Maybe hold out for an Angry Birds gathering? Maybe put them up on craigslist? Save it for next halloween? What I know for sure is that Craigslist rocks and it’s folks like Gabriela that make it so amazing. I am never going to buy a costume again from a retailer. Maybe this could be extended to pumpkins, decorated christmas trees, easter egg bunny costume? I do like making things, but I love the adventure of craigslist. Great work. I appreciate your work. Really amazing halloween costume. This is exactly what I was looking for. Thanks for sharing this great Information! That is very interesting smile I love reading and I am always searching for informative information like this. I see the different design of the cloth. This is exactly what I was looking for. Thanks for sharing this great Information! That is very interesting smile I love reading and I am always searching for informative information like this. May you dedicate the New Year to humanity and the betterment of the world at large. Wishing you and your family a very happy and prosperous new year 2017. Amazing blog. Thanks for sharing this article. I really like it. Very interesting blog, looking forward to more wonderful. also read my blogs hope this will be help you in pets industry. Thank you Brian for just a good hint, perhaps non-developers such as my family must be able to draw this particular off: )This is basically important for any multi-international web-site when it comes to SEARCH ENGINE MARKETING. I’ve attempted to employ, nonetheless it isn’t going to is effective at all. Thanks a lot John for the wonderful idea, even non-developers just like me personally should be able to pull this particular off of: )This is basically essential any multi-international website in relation to WEB OPTIMIZATION. Serfcompany is a Software Development and IT services firm of highly qualified (nearly 52 developers) and experienced professionals who provide quality, cost-effective solutions to client’s information management needs. Our main concept is automation which could help you sell something or promote your company. Our company does not pretend to show our excellence, we simply do our job with the entire dedication and passion. And we are the best in it.